In Los Angeles in the late autumn of 1970, my cousin, Cathy and I, 21 and 20 respectively, lay slumbering in our twin beds in the Mother Goose wallpapered nursery of my grandparents’ old home. It was about 3 o’clock in the morning and I was startled from a deep sleep by the sounds of creaks, thumps and bumps in the dark house. Scared frozen under the covers, I couldn’t get up and step across the two feet of floor that separated my bed from my cousin’s, to shake her awake. Time ticked by endlessly before I could muster enough mobility in my lips to peep out Cathy’s name to discover that she too, had been lying awake, stricken dumb with dread. It’s just as well I hadn’t been able to touch her in the pitch dark, because her heart, barely beating as it was, might have stopped altogether. We lay goggle-eyed and petrified, scarcely breathing, expecting at any moment to be slaughtered in our beds, the mysterious cause of our tragic and untimely deaths witnessed only by Jack and Jill and Little Bo-Peep (who probably wouldn’t talk); when the jangling of the telephone in the den downstairs levitated us into action. We leapt from our beds, raced pell-mell into the hallway and crashed headlong into my frantic mother, nearly catapulting her over the banister into the stairwell. She’d been awakened and unnerved by the same hair-raising thumps and creaks, and the ringing phone had instantly jarred her from her own bed in the room next to ours. We three crazed, flannel-gowned women thundered downstairs to the “T.V. 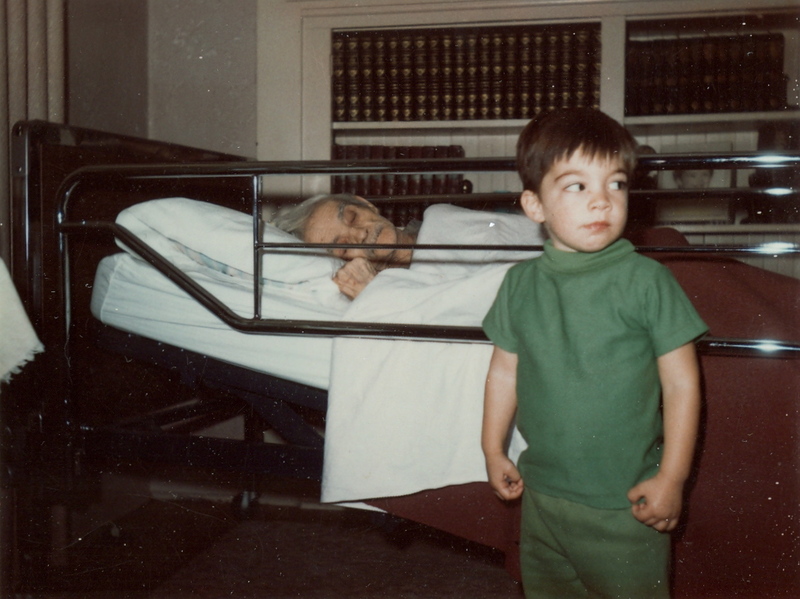 Room,” where my grandmother slept in the hospital cot that my grandfather, after suffering a stroke, intermittently occupied between nursing home visits. In the intervals when the ailing old gentleman was at home, he appeared to be unbothered by the steady stream of boisterous folks chatting around his bed and watching television as he slept, and we occasionally found him awake and observing the proceedings in full swing around him. As we reached the bottom of the stairs, my grandmother had just answered the phone to receive the sad news from the nursing home that my grandfather had passed away in his sleep. Within a very short time, the house was filled with dazed and sleepy aunts, uncles and cousins. Coffee, percolated in the old aluminum pot, was poured and sipped as low murmuring voices discussed the sad news through the quiet munching of warm doughnuts that someone had thoughtfully stopped for at Winchell’s. Long-distance phone calls were made to notify my grandparents’ Foreign Service offspring away in other lands. My father was one, having departed just a few weeks earlier to settle into his new post in Colombo, Ceylon, to organize his routine and await my mother’s arrival from Los Angeles after the impending birth of my sister’s baby, their second grandchild. My family was rife with punsters, one of the more prolific being my Uncle Tom. The minute my father was posted to Ceylon, Uncle Tom began an endless crooning of an old ballad, “So Long for a While,” but singing instead, “Ceylon for a While.” Other kernels from his inexhaustible crop of corn included (while rubbing his chin and raising an eyebrow), ‘”I SEE!” said the blind man as he picked up the hammer and saw;”’ and hollering, “ABYSSINIA!” as he waved goodbye and walked out the door. The silly jokes made us groan and giggle every time we heard them, but a truly unforgettable pun was the one unintentionally coined by my maternal grandfather years earlier when I was 8. Soon after our arrival in Los Angeles, on leave from our first 2 years in Guatemala, I was dancing around the living room of my grandparents’ home while my grandfather sat quietly on the sofa, apparently mesmerized by my grace and agility. “So, Susie, how do you like watermelon?” he suddenly asked, apropos of nothing. Mid-leap, I replied that I liked watermelon just fine and wouldn’t mind having a piece. Maybe all that dancing had me made me hungry. I bee-lined for my grandmother’s kitchen, but my grandfather called me back, “No, no, Susie! Watermelon! Watermelon!” We parried verbally for a while, the volume increasing with each exchange; I, insisting that I liked watermelon just fine while pirouetting myself dizzy back and forth to the kitchen trying to get some, and he repeatedly calling me back to ask me how I liked it. Red-faced with frustration that what had begun as innocent small talk had degraded into conversational combat, my born-in-Greece and usually good-natured grandfather eventually broke his words down into heavily accented syllables, shouting at me through his clicking dentures as though I were a million miles away, simple-minded and deaf to boot, “HOW? DO? YOU? LIKE? GUA? TE? MA? LA?” Sadly that day, neither my brilliant comprehension skills nor my nonpareil dance performance were rewarded with a nice refreshing piece of Guatemala, because there wasn’t any in the house. The call to far-away Ceylon was initiated by dialing “zero” on the old black rotary dial Bell telephone (the solitary phone in the house, weighing in at about 50 pounds and sitting on the expressly designated “Telephone Table” in a corner of the expressly designated “T.V. Room”), thus accessing the required intervention of the long distance operator. Because Ceylon was almost half a world away from California (about 10,000 miles with a flight path through the Hawaiian Islands and Guam) once the caller and the callee were connected, both parties believed that in order to be heard, despite the miracle of the long distance technology in their hands, it was absolutely imperative to shout at each other at the top of their lungs. It seemed disrespectful and heartless to yell at my father that “PAPOU DIED!” but it was, nevertheless, left to me to yell it at him. During the course of the shouted, tearful exchange, my father yelled back at me that his wristwatch had inexplicably stopped a while earlier. Later, my mother, my cousin and I calculated it to be the same time that we had heard the noises that had so frightened us, and ultimately we determined that the two incidents, the eerie sounds in California and the sudden stopping of my father’s watch in Ceylon, coincided precisely with the hour and minute of my grandfather’s passing. Beautifully and perfectly phrased. That, in itself, was a little short story that propelled me right into your little life… those memories. It was quite a thrilling read for me, which brought me to tears by the end… Sweet tears.. Happy Birthday mom..! Wow, Susie. I am not sure what is more amazing: the story, the memories evoked or your writing. Thank you. What a lovely mixture of compassion, sensitivity, and humor. I loved it!